BOOTS. The only boots I’ve picked up for fall so far is a second pair of these Rag & Bone Newbury boots (already have them in tan)– they’re just so comfortable! I will say that they are certainly more casual and a little more rugged looking than I’d like for all occasions (even with the heel). With that in mind, I may be on the hunt for a new pair of sleek over the knee boots and/or ankle boots for those other times. I did pick up this pair of booties during the Shopbop sale (still going on, btw!) which should take care of all my fancy bootie needs. Shop my favorite boots of the season below! great picks and love your new booties. LOVE otk boots right now…the pair with the quilted detail are great! I really like the Tory Burch booties and the Jeffrey Campbell heeled boot. I’m obsessed with OTK boots this year and searching for the perfect pair! I’m only 5’2” so it’s been a little difficult to find a pair that’s not too tall. I’m totally jealous that you have two pairs of the Newbury boots- I’ve been lusting after them but just haven’t convinced myself to buy them yet:) Great picks!! Over the knee boots are my favorite! and so are those Rag and Bone Newberry booties. Those are next on my list! And I am loving those heels you snagged at the shopbop sale! I LOVE how you did this post!! And not to mention obsessed with all of these. I just ordered some little black suede ankle booties from Old Navy, but now I want all of these as well. Cheers to cooler weather! These are all nice, I dont have the Rag & Bone Newbury they are chic but the heel height im very iffy on. I have my boots from the last winter Cole Haans which look like the stuart weitzman 50/50s a tory burch knee high lace up pair, some other leather pairs and tons more in storage. The only one Id really buy is a Cole Haan Avalon. Im dying over those with the buckled detailing. I have been coveting the Lowland flat boots forever. So gorgeous. These are all amazing pics! I love thigh high and over the knee boots! I have way too many boots but now you’re convincing me I may need another pair!! Completely in love with those quilted over the knee boots (a girl can wish, right?) and those Sam Edelman booties are so perfect! Great selection here! Some amazing boots! I would say go with those lace booties! They dressy and chic the opposite of the rag & bones booties you have (which are fab by the way). Cute post :) great blog, I have followed you with Bloglovin and if you ever get a chance to check out my blog I would be delighted, thanks! I cannot get enough of the Tory Burch over the knee boots! So amazing! My husband just got me the Sam Edelman Petty ankle boots — they are perfect! I started buying Sam Edelman shoes last year and I’m now at 4 pairs. I can’t help myself, they’re just so comfortable for my feet! 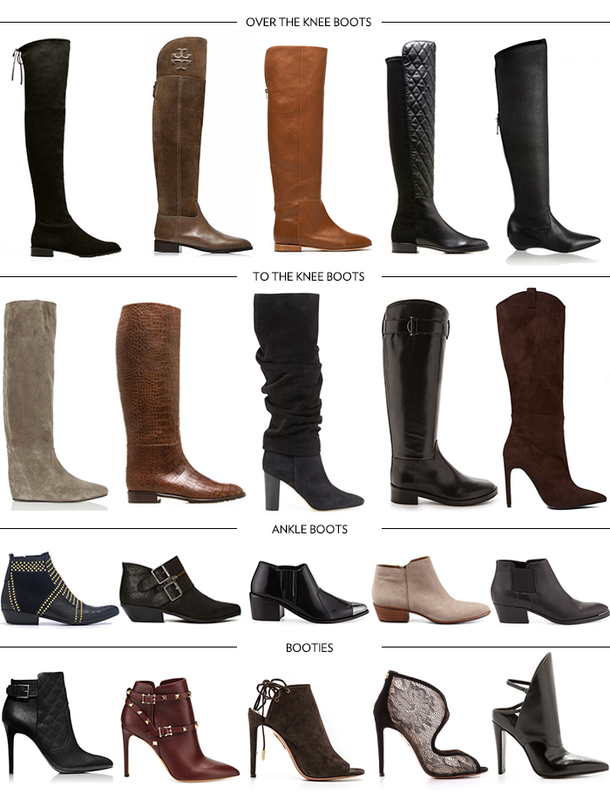 I’m still on the hunt for the perfect pair of boots and booties. I’ve been searching for the perfect flat boot for like 5 years now haha (the one I liked was about $600 and not in my price range) And now I’ve decided I want a pair of plum colored booties :) Love your picks!